One of my husband’s first loves is chocolate. I don’t know who came up with the idea that chocolate is only a comforting, craved after thing for women, because he would probably spend all day eating it if he could–and he’s definitely a manly man. When I told him that Amabella Chocolats was sending me some sample truffles, he was elated! Chocolate is always first on my list of gift items, and this Father’s Day is no different. Amabella Chocolats sent me three hand dipped chocolate truffles to try. The outer coating of each one was a sweet and delicate dark chocolate, and the inside was a creamy, smooth, cream filling flavored with certified organic flavor oils. You can choose between milk or dark chocolate for the truffle’s shell, and between eight different flavors for the creamy filling. They also offer vegan chocolate squares that come in any of the flavors and are decorated by hand painting. We (my husband and I, since he would have a fit if he wasn’t in on the testing of this!) found a ll of the flavors to be quite delicious. Amabella Chocolats sent their signature vanilla, rose, and chai truffles to be tasted. The vanilla is a delicate flavor and would be great for the person who wants things to be not too sweet or overpowering. A stronger flavor, the chai one really stood out as one that you’ll only need one truffle to be satisfied by. I’m a big chai fan and it did pass my taste buds. I think a combination vanilla-chai would be just wonderful, and Amabella Chocolats will do custom orders! The rose truffle surprised me by being light and quite pleasant. I was expecting it to taste a little bit like potpouri, but it was actually very soothing and relaxing. It would be a great match with tea or lemonade (does anyone feel a belated Mother’s Day gift coming on?). The packaging for the truffles is very pretty and would work just as well for a man as a woman. Tied with a sage green ribbon, I had to admire it before opening the box! 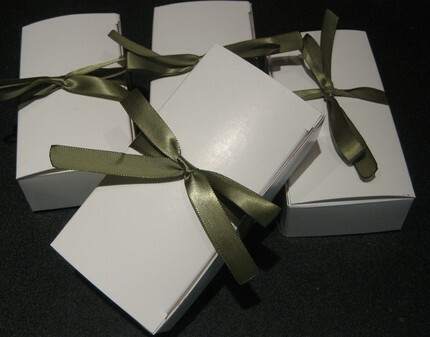 I am a little bit jealous of the person who perfected bow tying for these packages–mine never come out this great. Shipped by USPS, the truffles did arrive later than Amabella Chocolats anticipated. Days late, in fact. Unfortunately, this did affect the product a little bit. The truffle’s outer shells seemed to have been affected by the temperature changes in transition and had gotten a little chalky, as well as breaking in a few spots on two of the three truffles. The inside was unaffected, though, and still tasted great with a smooth consistancy. Amabella Chocolats is currently switching the shipping and packing options, though, so I’m told this shouldn’t be a problem ever again! Order a package of truffles or choclate soon. They are all handmade, so you’ll want to make sure your order will be perfected and shipped in time for Father’s Day. They’re priced reasonably at $10.00 a box (five pieces truffles, squares, or a combination). Remember, you aren’t going to need a lot of these to be satisfied! 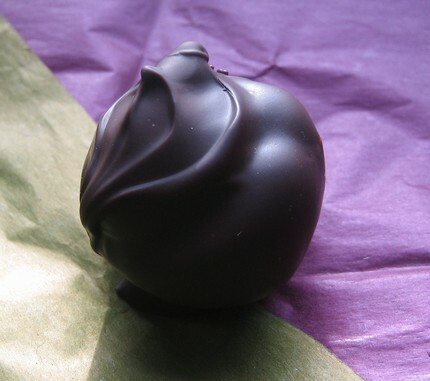 Amabella Chocolats has offered to give one of my reader’s a 1/4 lb. box of truffles (five truffles) in the flavor of his or her choosing! To gain an entry, you need to visit their website at http://amabellachocolats.etsy.com/ and tell me what flavor(s) you like the most. Be sure to leave your email address in your comment! Come back and tell me what you did (a separate entry for each thing) with your email address! This contest will be ending on Father’s Day, June 21 at 11:59 PM, EST. You left out an “a”! Terrific review – thank you for the tip! Oh lordy, and then I left out an “o”! You got to test drive CHOCOLATES? Wow. That's a deal. Maybe I should see if someone will let me test drive a housekeeper. I'd love to try the Chai dipped in dark chocolate. That would be something different! I would love to try the Chai and the Vanilla. Thanks for the giveaway. I would like to try ALL of them in milk chocolate!!! My favorites though are espresso and pumpkin spice. 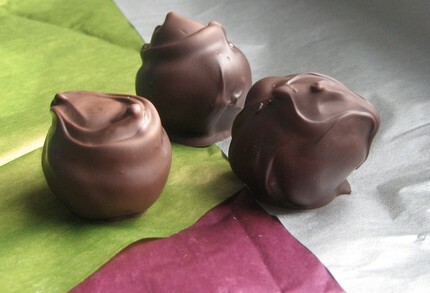 A batch of coconut truffles dipped in milk chocolate sound divine! WOw I haven't ever tried a Truffle mailed that actually tasted good. So now you have me curious. I think the chai flavor would be interesting. I just added your button to my site. I'm also a chai lover, but they all sound good! I added your button to my right sidebar. I've been meaning to do it for awhile now! I would like the signature vanilla or the coconut. They both look delicious! All the flavors look fantastic! If I had to pick, I'd choose either chai, vanilla, or cinnamon. Mmmm…I'd say the orange looks the most delicious, all though it's hard to say! They all look great. Oh, do these ever look tasty. I like Pumpkin Spice, coconut and espresso. YUM!!! Truffles are my favorite. I would love to try the Signature Vanilla, Pumpkin Spice and Coconut flavors. I'd love to try the Orange. At first the chai sounded great but then I saw the pumpkin spice. I would love to try these dipped in dark chocolate. Maybe 2 should be milk chocolate for my husband. The Truffles look so yum! I'd pick the Coconut and vanilla. I would pick chai squares or truffles! Pumpkin spice in milk chocolate sounds great! I like the Orange, Coconut and Espresso flavors. Thank you! Happy Father's Day to all the Dads!! I left a comment under your blog asking for more ideas. I just emailed 3 friends and sent it to you as well. Hmmm…still trying to figure this out….Enjoying Life and Michele VanPatten are the same!